Although this spice is expensive, saffron rice is a reminder why it's worth every penny. 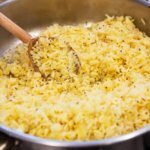 Saffron lends a luxurious flavour to rice, and this is a great side dish for Persian or Indian dishes. Saffron is part of the iris family, and has been used in various ways through many years. It was used as a treatment for colds, coughs, insomnia, stomach ailments and more thousands of years ago. Now it's usually used as an ingredient in various dishes, both sweet and savoury, adding an aromatic flavour and yellow colour. Saffron was used to dye textiles. Yes, you can do more with it than make saffron rice! One single grain is able to colour 10 gallons of water with its bright yellow shade. Saffron is also used (although more than one grain) to dye Buddhist priests' robes, which are a bright orange colour. Funnily enough though, the delicate saffron crocus which produces the threads, is purple in colour. 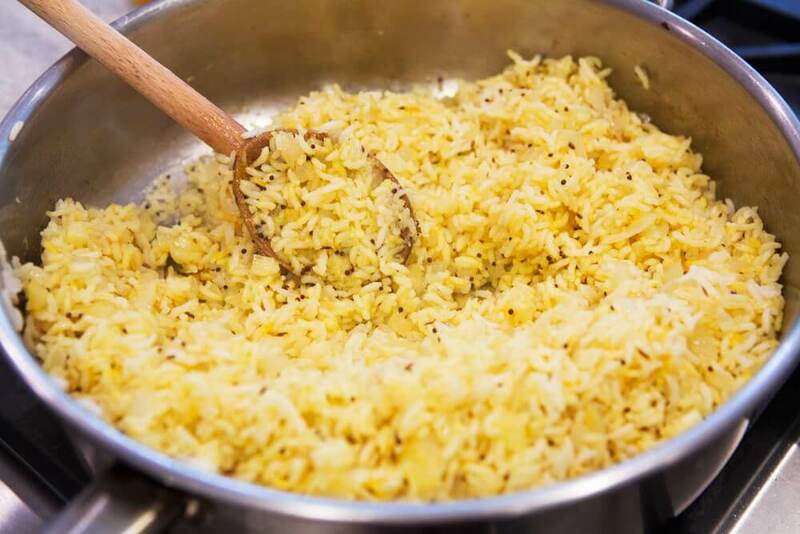 When making saffron rice, you will want to ensure you are using quality saffron. The cultivation and harvest of this aromatic spice is time-consuming and about 4,500 crocus flowers are needed to make an ounce of saffron spice. This is why saffron isn't cheap. Genuine saffron adds an earthy, pungent touch to saffron rice. Head to your nearest ethnic speciality food shop and seek out the real thing. You can also get genuine saffron in a supermarket but this might be quite old, so not as fresh-tasting as the ethnic specialty food shop kind. Once you have mastered this saffron rice recipe you will want to explore other saffron dishes. Try making a risotto using saffron as your main spice, adding ham, raisins and other tasty morsels. Spanish paella is another recipe for which a good quality saffron is a must-have. Wash the rice, then cover with cold water and soak for 30 minutes. Add the rice and bay leaves. Cook, stirring for 6 minutes, or until the moisture has evaporated. Soak the saffron in 2 tablespoons of hot water for a few minutes while the rice cooks. Add the saffron to the rice. Add the boiling vegetable stock, salt and 375ml of boiling water. Reduce the heat and cover. Cook for 12 to 15 minutes or until the rice is cooked and the water is absorbed.